The Vault doesn't compromise on sound quality, thanks to its high-end DAC and NAD heritage, and makes mixing your collection with all that the cloud has to offer utterly effortless. Bluesound boasts a listening experience like no other, aiming to bring the attention to detail and focus on sonic perfection of top end hi-fi into the modern, convenient world of wireless connectivity. The brand is from some of the people behind NAD, who have been making quality amplifiers since the 1970's. So they really should know what they are doing when it comes to good sound. 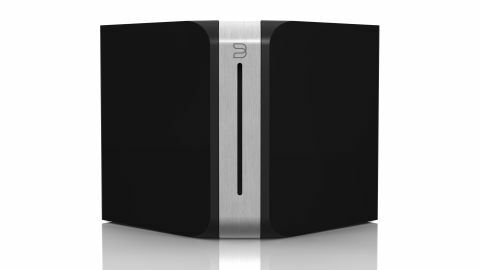 There are a number of products in the Bluesound ecosystem, some designed to work with your existing hi-fi set up and some self contained speakers. The Vault is the former, consisting of a high end DAC - supporting up to 24-bit 192khz recordings - with a CD burner and 2TB hard drive built in. Managed through an app on either iOS or android, or via a computer, the vault can rip CDs to the highest definition possible, and also stream music from your tablet or phone from a number of online music services, including Tidal, Spotify and Tunein radio. The unit itself has a sleek, minimalist design, a shiny black and chrome cube with just one button on the top and a slot in the front for CDs. It connects to your router via an ethernet cable, and to your stereo system via an RCA phono cable. There are also a couple of USB sockets and a digital optical input on the back. All the cables you could possibly need are included in the box, which is a nice touch, including two different length ethernet cables, as well as gold plated RCA to RCA and RCA to minijack. It's meant to be left on all the time, claiming extremely low power consumption when not in use, which is why it has no actual power button. The single button instead both mutes the device and lets you know what the Vault is up to by changing colour and flashing in various different ways. It's very simple to set up - just plug it in and it will connect to you local network and can then be accessed directly from the app. I tested it using a classic NAD amp I bought in 1997 (still going strong nearly 20 years later, testament to Bluesound's heritage) and a pair of similarly-aged Mission 732 speakers and they really came alive. The difference was so much more than when playing the same audio from a phone or tablet. High definition streaming from tidal is a joy, and CD's copied in the highest quality format sounded as good as, if not better, than they did in my CD player. It really is only when you hear it that you can appreciate how much better high definition audio is - it's not so much that MP3's don't sound okay, just that FLAC and WAV files sound better. Much better. The action of saving your music into the Vault couldn't be easier. You just pop a CD in, the Vault rips it to whichever file format you have chosen, finds the metadata - artist name, album title, track names and artwork - adds it to your library and ejects the disk to let it know when it's done. You really don't have to do anything. The process takes a while, although may be quicker at lower quality settings, but you can start playing tracks once they are added while the rest copy if you're feeling particularly impatient. The Vault doesn't actually play CDs though, but there is so much storage space that unless you have a really big collection you can probably fit it all in - there's room for literally thousands of albums. The Vault then acts as a networked drive as well, so you can use it to wirelessly back up data and play music from your computers and anything else on your network. Just tell it where to look and it will add it all to your library. The Vault is controlled from an app on either iOS or android, pc or mac. From here you can play any of the music you've saved on the vault, and stream from services like Spotify. It works by adding tracks you select from either your library or one of your streaming services to a playlist which you then play them from. This feels a bit strange at first. It's not intuitive at all as usually you just play things straight from their respective app - you click tracks, and they play - whereas in the Bluesound app you click tracks, and it adds them to the playlist instead. These feels a bit pointless at first, but once you have spent a bit of time adding albums to your library it makes more sense - it encourages more attentive listening because you don't just jump from one track to another as soon as you select it. At first I just added loads of songs, but after a while I found myself being more selective about what I lined up to play. The Bluesound is angled more at those who like to take time to listen to music as an activity in its own right, rather than cater to those who just want to whack something on in the background. We get so used to everything being instant and simplified these days that when things are a little bit complicated and require some time and effort we are instantly resistant to them, but generally the more you put into something the more you get out of it. I very much found this the case with the Bluesound system. Once you have a massive library to sort through, you can add a few albums to the playlist and listen through that without getting bogged down and distracted by the weight of all the other music you own. The app is easy enough to navigate your way around, with a menu to the side to which you add the streaming services you want to use alongside your own music collection. There are loads of these on offer, I added Spotify and Tidal, as these are two of the main contenders to the music streaming crown. Apple Music is now live, but there's no clear idea when this will find its way into the Bluesound world. It is apparently on the list for an upcoming update, but nothing concrete has been released. Tracks from Tidal have to be added to the playlist, as can tracks from Spotify, although Bluesound gear does support Spotify connect, so you can use Spotify's app itself to control what's playing. I found this the easiest way of streaming, with the familiarity of use and greater catalogue of the Spotify app beating the superior sound quality of Tidal, which you have to use inside the confines of the Bluesound app. Tidal though is pushed slightly, with links to the albums appearing in songs you copy yourself into the library.